This week, the Economist/YouGov Poll asked Americans how they would like to ultimately balance the federal budget. While I think the aggressive fiscal policy is necessary in the near-term, eventually as a nation, we will have to make some difficult choices in balancing the federal budget. When pollsters asked people whether they preferred raising taxes or cutting spending in order to balance the budget, cutting spending was “more popular…by a margin of 62% to 5%.” I find this percentage of Americans who do not want tax hikes surprisingly small. With the unemployment rate staying at elevated levels and the economy struggling, approximately 49%–nearly HALF– of all Americans will pay no federal income taxes at all for 2009. This is an amazingly high number and implies that in a room of 100 average Americans, 49 of those people will not pay federal taxes this year and a mere 5 of them would rather cut spending than raise taxes. Talk about rational choice! Half of the room would stand to benefit from increased government spending and an increased tax burden on the economically well off. Put another way: It would be in the economic self-interest of a non-taxpayer to want both increases in the tax rate and increases in spending, yet somehow they prefer neither option. Moreover, when asked how exactly to cut spending (with respondents allowed to select as many as may apply), by far the most popular answer was to cut foreign aid–71% agreed–followed by the environment (a distant 29%) and a trio of mass transit, agriculture, and housing (at 27%). Hat tip to the Economist for the poll. Foreign aid checks in at slightly less than 1% of our entire federal budget (Wikipedia), yet somehow 71% of Americans feel as though it should be cut. We can cut 100% of our foreign aid and it would have a negligible impact on our deficit. If anything, that is an argument for INCREASING foreign aid. Our country does far too little in order to both help with global problems and build good will on an international level. 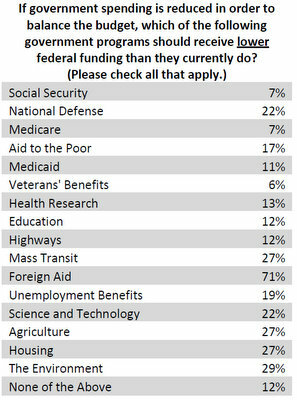 Notably low on the list of areas for spending cuts was social security, at 7% of respondents. Is so because to many, the tangible benefits of the Social Security are witnessed first-hand on a regular basis, while the benefits from foreign aid are more distant and abstract. The idea of improving the world we live in apparently does not strike a chord with many Americans and the lack of respect for the environment and mass transit confirm this phenomenon. …the vast bulk of the money goes to large farms , often corporate ones. These subsidies have become simply another form of corporate welfare. Looking across all crops, some 30,000 farms (1% of the total) receive almost 25% of the total amount spent, with an average of more than $1 million per farm. Eighty-seven percent of the money goes to the top 20 percent of the farmers, each of whom receives on average almost $200,000. By contrast, the 2,440,184 small farmers at the bottom–the true family farmers–get 13 percent of the total, less than $7,000 each. The huge subsidies…actually drive out the small farmer. I’ll save my next budget rant for a later date–military spending (22%)–but will end with this teaser: most people I speak to are unaware of the fact that spending for the wars in Iraq and Afghanistan are not counted in our fiscal spending calculations and that they receive special budgetary treatment.